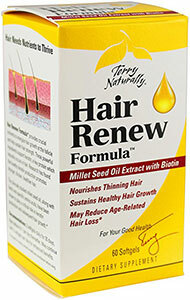 Millet Seed Oil Extract – a unique, clinically studied botanical rich in minerals and amino acids that support production of keratin, the main hair building block. These components, along with other key ingredients in Hair Renew Formula, combine to provide maximum nutrient support for healthy hair growth. Amount Per Serving% Daily Value Vitamin A (as retinyl palmitate) 4,000 IU80% Vitamin E (natural mixed tocopherols)45 IU150% Riboflavin (Vitamin B2) 4 mg235% Vitamin B6 (as Pyridoxine HCl) 20 mg1,000% Folic Acid400 mcg100%Biotin 5,000 mcg1,667% Pantothenic Acid (Vitamin B5) (as calcium pantothenate)20 mg200% Zinc (as zinc gluconate)10 mg66% L-Cysteine 100 mg*L-Methionine 100 mg*Millet (Panicum miliaceum) Seed Oil CO2 Extract standardized to contain >4 mg of miliacin400 mg*Horsetail (Equisetum arvense) Extract standardized to deliver 7 mg of Silica100 mg** Daily Value not established. Other Ingredients: sunflower seed oil, lecithin, beeswax, gelatin, glycerol, purified water, titanium dioxide, iron oxide. Contains Soy (less than 5 parts per million). No: sugar, salt, yeast, wheat, gluten, dairy products, artificial coloring, artificial flavoring or preservatives.